The smallest of the three divers. Bill slimmer, up-tilted with the culmen straight, often held pointing upwards. Forehead sloping, and flat-chested. In flight, neck a little slimmer than in Arctic Loon, more curved, bill often held upwards, and the feet do not extend so far beyond the body. Adult breeding: unmistakable. Red patch on the neck looking black from a distance. Back brown/grey looking uniform. Adult non-breeding: just over half of the sides of the neck are white, also visible in flight. Eye surrounded with white. Back with pale speckles. Flanks usually pale all along the waterline. Juvenile: like the non-breeding adult but the white areas on the head and neck are finely streaked grey and the speckles on the upperparts are greyer. Voice: strident, monotonous call “quah-quah-quah”. Resonant duetting song. L. 55-67 cm ; W. 91-110 cm. Similar species: Arctic Loon, Common Loon. 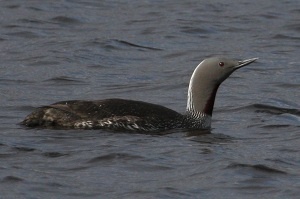 Slightly larger than Red-throated Diver with a dagger-shaped bill, the culmen being convex, often held horizontal. Forehead often steep and nape profile rounded. Thick-necked. Chest often bulging at the waterline. In flight, the neck is a little thicker than the Red-throated Diver, held straighter, and the large feet extend more behind the body. Adult breeding: crown and nape grey. Throat and foreneck black. Upperparts with large white spots. Adult non-breeding: at least half of the neck is dark as seen from the side (also visible in flight), often with a darker border where it meets the white. Usually no white around the eye. Conspicuous white patch visible at the rear of the body when settled on the water. Upperparts uniform grey/blackish. Juvenile: like the non-breeding adult but distinctly scaly above. Voice: loud, plaintive song “klooee-ko-klooee-ko”. Hard , grating calls: “knarr-knorr”, or drawn-out “aaa-oo”. L. 63-75 cm ; W. 100-122 cm. 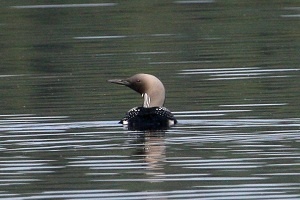 Similar species: Red-throated Diver, Common Loon. Large heavily-built diver, quite variable in size. Settled on the water: large bill held straight most of the time and thick neck on most individuals. Steep forehead and flat crown which can show a bulge. A white stripe is visible all along the flanks, as Red-throated Diver. In flight: thick neck held horizontally, large feet. Wingbeats more measured than in the other divers. Adult breeding: head black, back covered with white spots, and a white cross-bar with black stripes on the sides of the neck. Adult non-breeding: head and nape dark, fairly clearly demarcated from the white neck. Dark half-collar on the lower neck. Pale eye-ring. Upperparts uniformly dark. Juvenile: like adult non-breeding but distinctly scaly on the upperparts. Voice: weird laughing call, quavering and high-pitched, a repeated “hoo-voovoovoova”. The song is a moaning similar to Arctic Loon. L. 73-88 cm ; W. 122-148 cm. 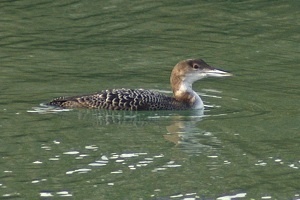 Similar species: Arctic Loon, Red-throated Diver.